CRM 2015 latest update has changed several issues regarding User Interface and made navigation easier with less scrollings and less clicks. Navigating in CRM 2015 now follows the same principles as Microsoft Dynamics Marketing. Check out this video to have further information about navigation and other features regarding Update 1. 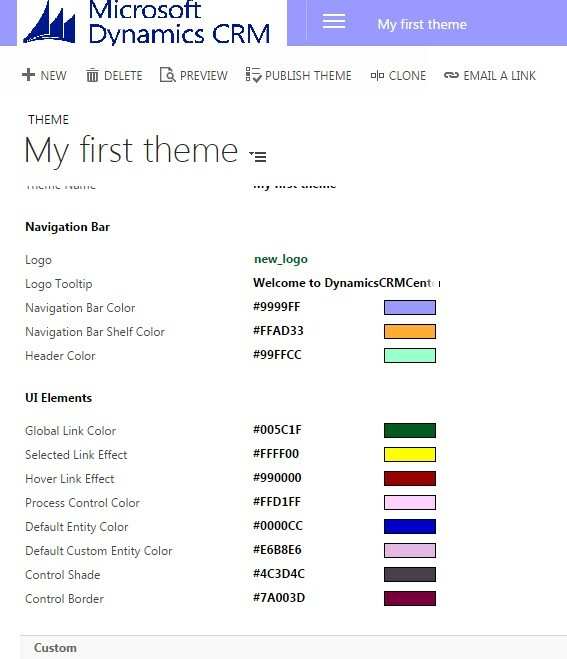 Let’s have a glance to a new feature of this last update (UPDATE 1): Creating themes! A theme is a set of customizations of the graphic interface that you can change to make it fit your corporate visual identity. The three main parameters (I mean those that you will see all the time when navigating) are the logo, navigation bar color and navigation bar shelf color. Here is a screenshot that explains correspondence between colors and items of navigation. You can also try to test other UI elements by picking other colors. ← Dynamics CRM 2015 Spring Release is here !